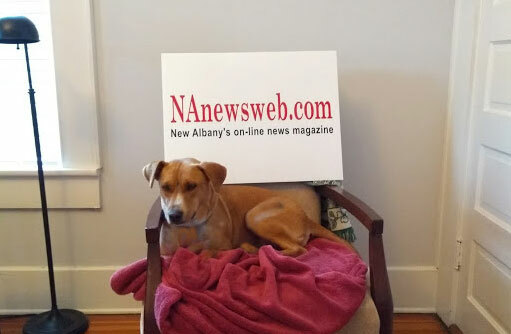 At NAnewsweb.com, we have recently acquired a dog. Until then, we rarely noted the weather, unless the sirens were blasting. Prissy strayed up to our home a few months ago, caught our attention by eating out of our front porch bird feeder and hung around for the several weeks it took us to decide we wanted a dog. A trip to the vet turned up a strong, healthy, year-old dog with no chip, no former owner known to be anxiously awaiting her return home. Our free foundling quickly escalated to a $500 dog with vet fees for exams, shots and neutering, dog equipment, food, etc. The 45 pound Prissy would be mostly an indoor dog, because we have no fenced yard and live in the city limits. I won’t go into detail about the eleven embarrassing tries it took us to rig a tie out that would hold her. Leave it at the fact that a childhood friend visiting from Missouri smirked through most of our unsuccessful rigs, and drove home laughing at our failures. We happily reported to him some days later that we had finally prevailed. Or, maybe Prissy decided to let us win. After all, she’d hung around for a month with no restrictions on her travels before we adopted her and started forcing her compliance. Prissy, hard at work in the NAnewsweb.com office. Many things have changed with the coming of Prissy. Dogs alter your schedules, dig holes, make all manner of messes, can’t be left behind on spur-of-the-moment day trips. They are really kinda gross pets. Our three cats are much more user-friendly pets, but they are not amused by Prissy. No charming “brotherly love” huddles on couches or beds at our house, believe me. Which brings us to last night’s weather. We were way off schedule yesterday, and the weather was threatening all afternoon. The cats were fed and settled by early evening. No problem, cats are easy. Despite the look of the sky, Accuweather said that there was only a 4% chance of rain in New Albany overnight. Good, we could wait until bedtime to take Prissy outside for her last toilet run. As you already know, the 4% hit New Albany in the evening. Early bedtime came and went. Regular bedtime came and went. Bolts of lightning were flashing on all sides of our house, rain pouring down. Prissy and I stood at the back door and observed the weather three times. A toilet run under the trees — not gonna happen in the lightning. A little before midnight, Accuweather finally notified me that New Albany was under a severe thunderstorm watch until 12:30 AM. I decided to wait it out and take Prissy out when the storm passed. Around 1AM I got a flood watch warning from the National Weather Service. At 2:00 AM we were still waiting for the 4% to finish falling. Prissy had long since curled up and gone to sleep. I decided to do the same. We went to bed about 2:30AM with lightning still flashing and thunder still rumbling as the 4% continued to fall. I said a little thank-you prayer to the Lord for holding back the other 96%. At about 8AM this morning, Accuweather sent me a flood watch advisory and said we have a 70% chance of rain today. Thanks, guys, for the heads up. At 9AM Prissy and I ventured out to her toilet area in a medium rain, no lightning. She did her long-delayed business. She is a good dog. This morning, we contacted a weather reporter we actually trust. 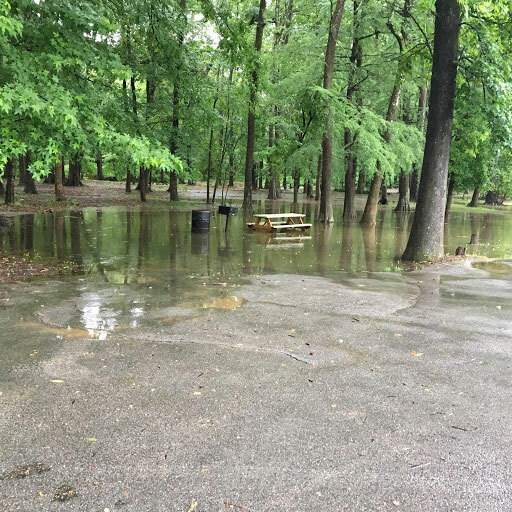 Our friend Joe Wilson tells us that by noonish today 5.16 inches of rain had fallen at his New Albany home since last night. Thank you, Joe. We hope you have a large enough gauge for the rest of the day.